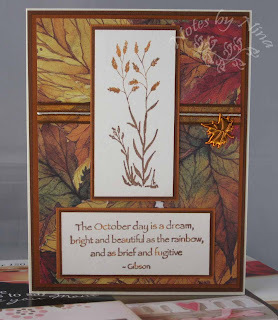 Repeat performance, I love this Autumn stamp set and paper. This is actually a get well card for one of the ladies from the Close to my Heart gathering I attend once a month. She missed last week so we (all the ladies) decided to send her a card for each day of the week. I was rushed so I could not wait to set up my light tent so I am stuck with my sub-standard image. It really does not do this for this card. 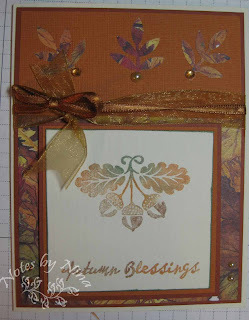 Supplies: Cream, orange and burnt orange cardstock, Designer paper-Provocraft, TPC Studios – Autumn Harvest, misc ribbon, Martha Steward – Frond Branch punch, Kaiser gems and pearls. It is my nephews birthday today, can anyone guess what he is interested in?. The UFC is double layered to pop it up. The colored cardstock and mesh I think work well for a young teen. The inside has a typed message of " Ultimate Happy Birthday". 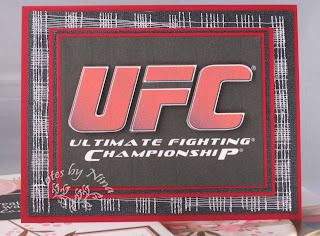 Supplies: Cream, black and red cardstock, Designer paper - silver mesh, UFC logo - UFC website. I have had this sheet of autumn leaves paper for forever, I don't even know where I found it. I was cutting it up and attaching it to cardstock before I remembered that I needed to get the name... which I was not able to identify other then it is made by Provocraft. I love fall, I love the out door colors and the crisp air. So I seem to collect Auntumn themed stamps. I brought this set last week and sat down to made this card right away. I think it worked out well. I used my Tombo markers to get that mixed colors. Supplies:Cream, brown and burnt orange cardstock, Designer paper – Provocraft, TPC Studios – Autumn Harvest, Recollections – Autumn leaf brad, Misc ribbon. 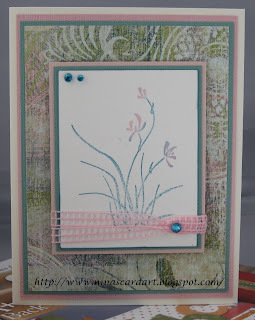 I have not managed to complete one card this weekbut I do have several in the stages of being worked on. I have a Close to my Heart gathering tonight then a Stampin' Up one on Sunday so I should have some projects to post next week. Thought I would try a different style of card for this, I like the style but I think I would use something softer for the cupcake next time. I used 4 colors of Stickles on the cupcake to give it texture then I added clear sparkle glass beads. Supplies: Cream, brown and pink cardstock, DCWV –The glitter stack, Sunshine Designs - Cupcake, Inkadinkado – Birthday Wishes, Stickles, misc glass beads and misc ribbon. A simple thank you card for today. Have a great Monday. 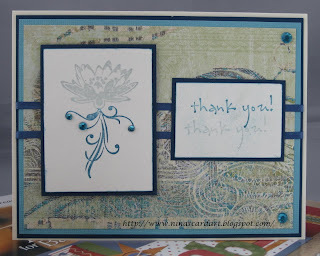 Supplies: Cream, navy and teal cardstock, Designer Paper K&Company Addison Swirl Collage Flat Paper, Inkadinkado – Lotus Flower , Penny Black – Thank you, Kaiser Scrapbook Rhinestones, Spool o’ ribbon – Navy. Happy Birthday to my big sister Barb. 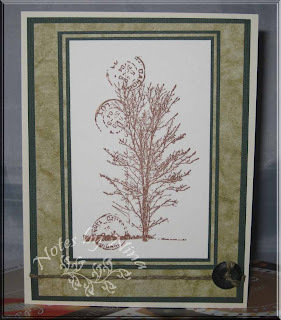 Supplies: Cream, green and rust cardstock, designer paper - MemorySkor, Heidi Grace Designer Rub-ons - Flourishes, Jolee - flower charm and gems, Bobbin Ribbon. Sister mine, have a fabulous birthday, I love ya. I decided to have a little fun with this picture, my sister made this watermark for me so I need to make all my adjustments in Photoshop Elements to be able to add it. I saw when I was playing that there are some funky little bevel like frames you can add as well. I am loving my watermark.. Thanks Barb you are so very talented. Supplies: Cream and dark green cardstock, designer paper - MemorySkor, Paperbagstudios - Lone Tree, Fashion Cord - Hemp, misc button. September 11 is a sad day for many many people and I feel for all those who were effected by the events of this day in 2001. For me Sept 11 is very personal day, in 2002 I lost my mom to cancer. I miss you mom. This is the final card that I made at my sisters, it is actually a tag. 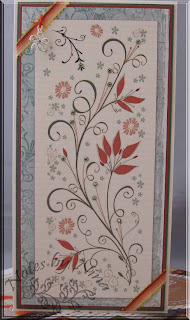 I have found I really like the K&Company Grand Adhesions dimentions, the colors and styles appeal to me. My sister Barb took the photos and she went all artistic on me :). Supplies: Misc dollar store designer paper, Inkadinkado - Round frames clear stamps , Wild Saffron Leaves Grand Adhesions, Elmer Gems, misc ribbon. This is the second card I made while at my sisters. I found this paper in the Dollar Giant, I have no idea what brand it is but it was double-sided and I loved the colors. The butterfly is K&Company - Wild Saffron, it is 3 dimentional with pretty little gems. My sister let me dig through her millions of buttons to find one that would work for this card. I had a great vacation with my sister, I took some card supplies with me and as we were shopping we found some more. I would love to be able to travel with all my supplies but I think that would require a u-haul. We had fun making cards, although I did feel a little lost without all my 'stuff' to work with. Supplies: Cream cardstock, Designer Paper - Memory Skor, Inkadinkado - Doodle Flowers, Stampology - Remember Borders, Jolee's - Butterflies, Martha Stewart - Brown Diamond stickers. Mr & Mrs Miles also took me to every winery imaginable to allow me to make some choice selections. Look at this view. A warm thank you to my hosts, I treasured my time with you. Thank you. Just a quick post this morning, I am heading into a long weekend this weekend so I am hoping that I can do a little catchup on my blog hopping, maybe getting a card or two created and to finally post a little something about my vacation that now seems like it was enjoyed months ago. I love this stamp set, I did a series of cards as soon as I had my hands on it. I was playing with separating the colors on the stamp with my tombo markers, I though it turned out nice. 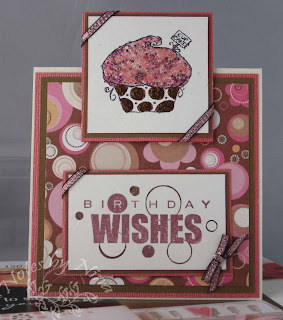 Supplies: Cream, pink and teal cardstock, Designer Paper K&Company Addison Swirl Collage Flat Paper, Stampin’ Up! – Asian Artistry, Kaiser Scrapbook Rhinestones, pink mesh ribbon .